LTP Lights RNLI Memorial Sculpture in U.K.
POOLE, U.K. — Lighting Technology Projects (LTP) worked with a lighting design by Speirs & Major Associates (SaMA) for a memorial sculpture commissioned by the Royal National Lifeboat Institution (RNLI). The monument is located in the gardens of the RNLI’s headquarters and commemorates the 778 rescuers lost since RNLI’s foundation in 1824. Sam Holland designed the sculpture and Satu Streatfield designed the lighting. 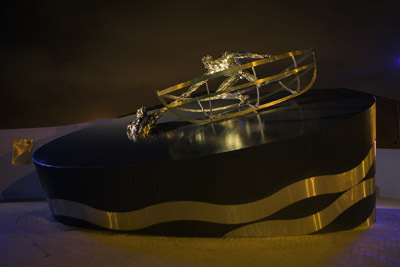 The sculpture shows a stainless steel boat containing a lifeboat crew member in a rescue attempt. The 4.5-meter-high memorial is lit with a combination of fixtures, some integrated into the structure itself and others set back on special mounting poles. An essential design requirement was for all physical evidence of the lightsources to be concealed, with just their effect adding presence and form to the work. Fixed (3200°K) warm white LED keylights are mounted on the dark gray plinth beneath the memorial sculpture, hidden behind the boat . One pair is up-lighting the lifeboat crew member and the boat interior, with a single fixture illuminating the person he’s saving. Rigged on a six-meter pole off to the side is a Meyer Superlight discharge source in open white, focused to skim flatly across the top of the entire sculpture. This also casts distinct shadows from the ribs of the boat down onto the plinth, adding texturing and drama to the flat surface. The fixture is fitted with an anti glare snoot to minimize any potential distraction factors for passing motorists. Another five of the same Superlights, fitted with double blue high temperature filters, are down-lighting the surrounding area, creating a shimmering effect to accentuate the warmth of the lighting focused on the lifeboat crew member. The installation is time clock controlled, switching on at dusk and off at dawn. The lighting accentuates the contrasts between the matte gray surface of the plinth and clean sheen of stainless steel of the boat, allowing the work to come alive and take on a different character at night as well as being appreciated during the day. Completing the lighting part of the project are two rows of single recessed cool white ACDC LEDs, with eyelid bezels to reduce glare and subtly denote the access ramp. For more information, please visit www.paigroup.com.